Before it adjourned last weekend, the state Legislature passed a memorial expressing opposition to the removal of dams on the Columbia-Snake River system and to contributing water from Idaho's reservoirs for flow augmentation to benefit fish passage except when expressly authorized by state law. Conservation organizations have long maintained that the four dams on the lower Snake River in Washington are the main obstacle to recovery of Idaho's salmon runs. Though the memorial has no legal effect, it indicates the state's view of how to best address anadromous fish conservation. The memorial was passed through voice vote by the Senate on April 7 following passage by the House by a vote of 60-8 on March 31. District 26 Rep. Donna Pence, D-Gooding, and Rep. Steve Miller, R-Fairfield, voted in favor. Sen. Michelle Stennett, D-Ketchum, said she voted no. "I think that socially and economically, it doesn't make any sense to talk about breaching these dams," said Miller, a co-sponsor of the memorial. He said the dams' power production and aid to barges that dock at the port of Lewiston, Idaho, provide economic benefits to the entire Northwest. The memorial states that the Legislature "recognizes the Columbia-Snake River System as the top wheat export gateway in the United States, with approximately 16 percent of all U.S. wheat exports barged through at least one of the Snake River dams. . . ." In addition, it states that the Legislature "recognizes barging as the most fuel efficient mode of transportation." The memorial also noted the dams' production of 1,000 megawatts of carbon-free energy annually. Kevin Lewis, conservation policy director with Idaho Rivers United, contended that the memorial was "clearly engineered by the Port of Lewiston to support their failing business." In a website posting opposing the memorial, the conservation organization calls the port "a taxpayer-subsidized financial boondoggle where things continue to get worse." It notes that freight transportation on the Snake River, as measured at Ice Harbor Dam, has declined 69 percent over the past 18 years, and container shipments from the Port of Lewiston peaked in 1997. The website cites an article in the Lewiston Morning Tribune that stated that the port's operations lost $445,495 in fiscal 2014. Idaho Rivers United also stated that wind-energy installations in the Northwest produce about double the power that the lower Snake River dams do. "There is no doubt that hydropower generated at dams like Brownlee and Hells Canyon dams on the Snake and at Grand Coulee on the Columbia still have a place in the Northwest's energy portfolio, but the lower Snake River dams simply aren't significant," the organization stated. The Bonneville Power Administration website states that it relies on the four lower Snake River dams to help meet peak loads, especially during times when little wind power is being generated. "This ability to produce power when the system needs it most is crucial to maintaining a reliable power supply," the BPA states. The BPA states that replacement of the four dams would cost at least $444 million a year if they were replaced with natural gas-fired generation and at least $759 million a year if the dams were replaced with a combination of wind, natural gas and energy efficiency. However, Lewis noted that the four lower Snake dams are run-of-the-river projects without storage capacity, and produce most of their power during spring runoff when it is least needed. Brad Hughs posted at 11:29 am on Wed, Apr 15, 2015. Lewis needs a better understanding of how the system works. First, wind may have the ability to produce double what the Snake dams do, but they don't because the wind doesn't blow consistently and wind turbine efficiency is very low. Second, although the Snake dams are run-of-river projects, they have enough storage ability to help out year round when needed. If the forecast predicts a week of 20 degree weather, the Corps can begin building up storage behind the dams to meet the peak loads as everyone turns up their heaters. So pretty important if you don't want your heaters to cut out in the middle of a cold snap. RedFishBlueFish posted at 6:08 pm on Wed, Apr 15, 2015. Actually Brad, I have met Kevin Lewis and I am impressed by his intelligence and by his understanding of "how the system works". What he has that you do not sir, is facts to support his arguments. Please allow me to here address your points one at a time in the hopes that you do not have a personal vested interest in keeping the four Lower Snake River dams -- (which I strongly suspect because your points of misinformation are identical to recent opinion pieces from other dam supporters (see retired ACOE John McKern www.bluefish.org/beenwind.htm, David Doeringsfeld, manager of the Port of Lewiston www.bluefish.org/needscan.htm, Ron Dunning, president of Port of Walla Walla Commission, www.bluefish.org/damasset.htm). First, IRU's Kevin Lewis is correct in stating that wind power in the region doubles the amount typically produced annually from the Lower Snake River dams. If anything, he is being too conservative as I will demonstrate below. Consider as fact that Bonneville Power Administration, (BPA is the government agency that sells power from the sole nuclear power plant and from thirty-one federally owned dams in the Northwest) as advised by the Northwest Power and Conservation Council, is expecting the region's wind power capacity to reach 6,000 to 7,500 MW by 2017 (see www.bluefish.org/windstru.htm for instance). In stark contrast to stagnant growth in hydropower, the growth of wind power in the Northwest continues unabated. "Northwest wind power could more than double by 2025, possibly causing problems for managing the transmission grid, according to a new study. Wind turbines now operating or under construction can generate a peak output of about 6,000 megawatts, or the equivalent of 15 good-size natural gas-fired power plants, the Northwest Power and Conservation Council said. Most of that wind power was added in the past five years. The Portland-based council estimates the region could see another 5,000 to 10,000 megawatts of wind capacity by 2025." Consider next that the four Lower Snake River (LSR) dams have a capacity of 3000 MW while an average water year produces about 1000 aMW if spread out over a full year (notice the "a" for average in aMW"). During the spring freshet, dams throughout the West are pumping out an excessive amount of electricity, so much so that the BPA at times struggles to give it away for free (for instance see "BPA Curtails 6.7% Wind Capacity to Balance Hydro Oversupply" from Hydrokinetic Energy News June 2011, www.bluefish.org/curtail7.htm). Now for a little mathmatics, the 3,000 MW of nameplate capacity of the four LSR dams providing a 1000 aMW output is referred to as a 30% capacity utilization factor. Surprisingly coincidental, wind energy developers assume a 30% capacity utilization when working out the feasibility of their projects. You see Brad, 30% utilization of 6000 to 7500 MW capacity is 1800 to 2250 MW produced by wind in the Northwest's current and very near future (respectively). So Lewis is indeed correct in stating "that wind-energy installations in the Northwest produce about double the power that the lower Snake River dams do." You sir are of course correct in informing us that the wind does not blow all the time. It is equally true, however, that the Lower Snake River does not run at flood stage all of the time. Both source on average operate at around 30% of their capacity. 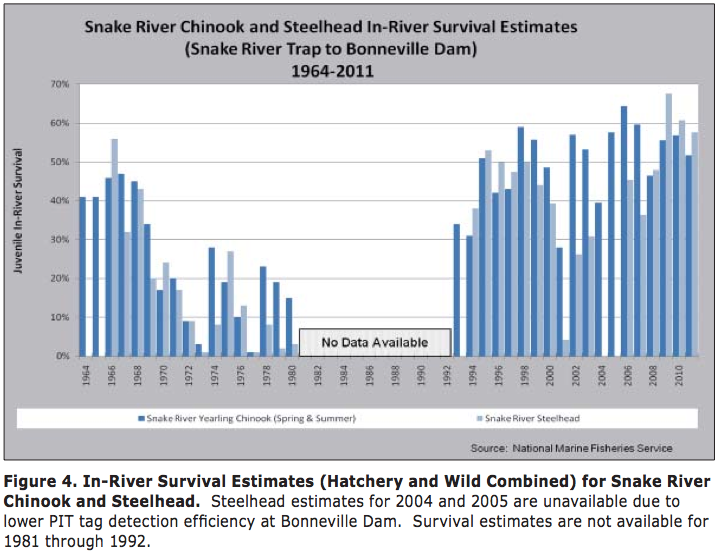 This discussion now leads natrually to your second suggestion: "although the Snake dams are run-of-river projects, they have enough storage ability to help out year round when needed." If you make this suggestion to the federal government's Reservoir Control Center they will straight up laugh out loud. The storage capacity impounded by the four LSR is minisculue compared to the big dams (aka. "storage dams" such as Chief Joseph and Grand Coulee) that are under the BPA's balancing authority. The point is Brad, the four LSR dams are never needed for balancing storage and are never called upon to do such. It would be easy enough to prove me wrong, just reveal to me a single instance that supports your argument. I've asked the BPA myself and I have yet to receive a response, I've received only laughter from Reservoir Control.